Many thanks to Joe Magno, head coach of Mayfair Highschool Baseball for stopping by to talk to us about the importance of staying hydrated, why putting donuts on your bat before your at-bat is slowing your bat speed and why “Daddy Ball” isn’t going to help your kid….regardless of how hard it is. If you’re a baseball coach or parent and you’re interested in learning how coach Magno lead his team to two consecutive baseball championships while leading the league in batting average, make sure you watch the baseball interview video below. It’S fool of useful baseball tips that you can apply this baseball season. Thanks for stopping by guys! You know I’m always grateful. You don’t have to be a great athlete to be a great baseball player. I think the training at the youth level is mediocre at best. The focus needs to change for the kids. What did you think of the interview?! 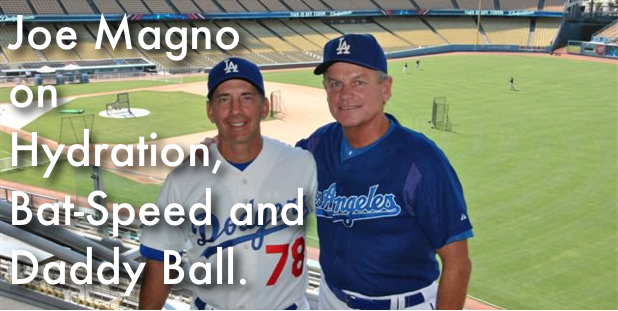 Let Joe Magno and me know what were some takeaways from our talk? Don’t forget to hit the LIKE button so we know that we’re giving helpful baseball tips!